I have been guiding Teemu from Finland for around twelve to fifteen years now. He came to Miami for the tennis tournament and wanted to do a little fly fishing. He brought a friend and his daughter who is seventeen and has never been fishing before. We decided that her first fish should be a good and memorable one. I went for some black tip sharks they had been around and are very good fish. We got set up shark fishing and hooked one right away. The black tip shark jumped twice and pulled the hook out. The tide was starting to go slack and the shark fishing got slow also. I decided to fish some flats for barracuda which we did both fly and spin fished for those. Teemu is a very good fly fisherman he used to guide in Russia for atlantic salmon, and has been fly fishing all of his life. He was making very long casts and stripping the fly very fast. Several barracuda’s were following the fly and biting the fly, but he could not get hooked up. I had Helga throwing a lure for the barracuda, she hooked up a nice one and we landed it. 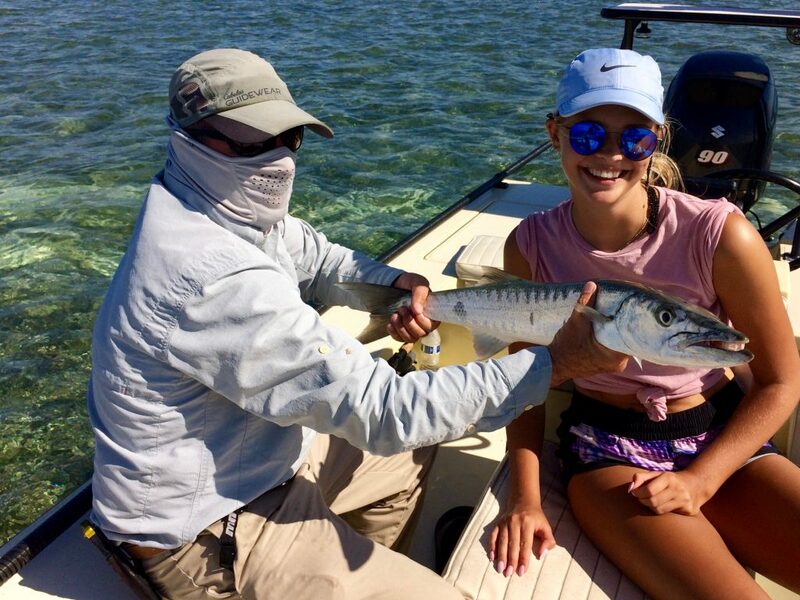 After catching a couple more barracuda all around the same size, we did not get one on the fly rod this time out. We went back to shark fishing, hooked up another black tip the after making a very long run. It came straight back at the boat and the hook came out when the line went slack. As a Miami fishing guide it’s alway nice to get someone there first and biggest fish of their life.